I’ve been a teacher since fifth grade, when I joined three other classmates in assisting the kindergarten teachers for several hours each day. I’ve been teaching yoga and meditation since 1976 – that’s such a long time that it even surprises me! In building Master Yoga (and recently Reawakening it), as well as creating the Ashram, I dedicated myself to serving and supporting others in their yogic process. It is a privilege to do such exalted work, and to do it as seva to my Guru. Yet the tables have been turned on me. Now, the Ashram staff, sevites and residents are supporting me in some incredible ways. While focus turned to life support for Master Yoga, everyone has kept on doing what needs to be done. They allow me to slip into the program at the last minute, as they sit there in a sweet yogic pose – sometimes chatting companionably, sometimes sitting in silence. They pick up the slack when I cannot do my share of the dishes or meal service. They carry big loads up and down stairs for me, run errands and come back smiling. Who is supporting whom? But it has always been this way. I was one of a seva crew numbering 300 or more, dedicating ourselves to full-time work plus more, in supporting Baba. The community I am honored to serve has always supported me, through their donations as well as their attendance at programs. The veggie garden we planted in late fall has yielded a bounty which we harvested on the day before our first snow storm. All along, as gardeners we thought we were taking care of the garden, but the garden is taking care of us. The boundary between support and empowerment melts away as the dotted line between me and thee reveals its true form – as the formless. This entry was posted in Meditation Teacher on November 27, 2012 by Svaroopa Vidya Ashram. Last night, we celebrated Diwali at Downingtown Yoga Meditation Center. First, we chanted to Lakshmi then, as we basked in Sri Lakshmi’s blessing, Swamiji illuminated Lakshmi’s subtle energies and the Diwali story of Lord Rama’s return to his kingdom. Afterward, we chanted again and enjoyed a delicious meditation lit by the room’s many candles and the light of the Self. The very sweet night ended with yummy prasad generously provided by Chinmayi (Celina) Sochaczewska and Connie Mohn. Share in the celebration by enjoying these photos from the evening (with a small sweet, of course!) and, coming soon, Swamiji’s talk on Lakshmi and Lord Rama, a special prasad for you. Please click on the photos to view the “Sakti-filled show. This entry was posted in Celebrations, Svaroopa Vidya Ashram, Swami Nirmalananda, Yoga's Teachings and tagged celebration, Diwali, Downingtown Yoga Meditation Center, Lakshmi, Swami Nirmalananda on November 14, 2012 by Svaroopa Vidya Ashram. When I look at my photos and the pictures of others chronicling our experience at Beach and Lake Ayurvedic Resort and Ganeshpuri, I can’t stop grinning. It was a wonderful, sometimes challenging, experience which I remember with delight. I continue to be touched by the unending kindness of the people who welcomed us and helped us along the way, including Rosie and Yogini and their helpers, all the staff at the resort, and the multitude of strangers that showed interest in us on our way to and from the Puja House and the temples. Even the taxi driver who took me on my shopping excursions was ever the patient gentleman. Swami Govindananda was so generous with his time and with the many gifts he gave to us. I think of him often and especially when I wear the lovely rudraksha bead he gave me. Shri Prasad Joshi and the two Ramas (forgive me, but I don’t remember their names) who joined us from time to time at the Puja House were also very hospitable. Swami Sadananda was most gracious in granting us an audience. Dr. Subhash was informative, charming, helpful, and fun to talk with. The Ayurvedic clinic therapists and assistants were professional, yet friendly and cheerful. Nor should I neglect a grateful mention to Ganesh for carrying us to and fro without complaint on his massive back. I couldn’t have asked for a better group of companion yogis and yoginis to share this experience. My experience was much enriched by the presence of both Swamiji and Vidyadevi. 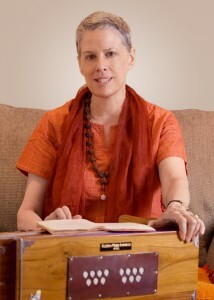 Vidyadevi is a graceful, compassionate, and natural-born teacher. I was always riveted by the lessons and stories, and I purely love Swamiji’s laughter which communicates such joy. It was a great privilege to meet her, and she warmed my heart. On reflecting on what I’ve written, I believe that it’s the people that I will remember most fondly about this trip. I am grateful to Swamiji more than I can say for all she has done directly and indirectly on our (and my) behalf to make this such a positive, memorable, and transformative journey. Thank you so much. This entry was posted in India, Yoga's Teachings on November 8, 2012 by Svaroopa Vidya Ashram. This weekend featured our new harmonium players, in their first public performances. Saturday night we held a satsang featuring a reading from Baba’s “Where Are You Going?” on chanting, with four harmonium players splitting the two chants, and on Sunday morning more new musicians played some of the Guru Gita chants plus the two satsang chants. I played the sticks, serving as a metronome to help them keep the rhythm and flow going. Every harmonium course I’ve taught before was a half-day program. This time we had the luxury of developing more chants as well as preparing for the public programs. I hope everyone will make their harmonium part of their sadhana, singing out the mantras and their love for God, and perhaps sharing it with others. This entry was posted in Meditation Teacher on November 5, 2012 by Svaroopa Vidya Ashram.